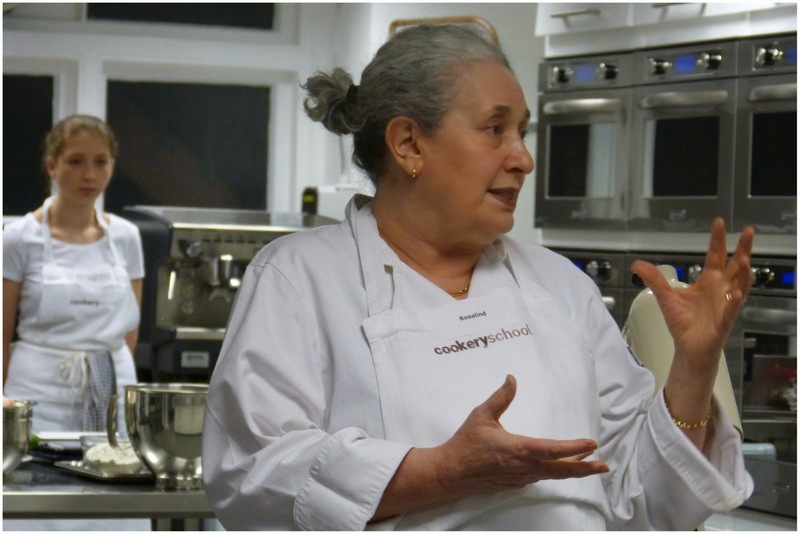 Led by the heart-warming and charismatic principal / head chef Rosalind, we were introduced to the Cookery School philosophy: simple, modern, sustainable and fun ways to cook at home. Rosalind's aim is to demystify how to cook the proper way and believes in being as eco as possible in every aspect of her kitchen. For example, the team haven't used plastic in their kitchens for years so have had to experiment with new ways of cooking and storing. Quality is key: the team try to use ingredients from sustainable sources and try to only cook with produce that is in season. There is a lot of thought put behind which suppliers they use and work with. The chocolate they buy is from a company called Original Beans which plants a tree for every bar of chocolate sold. Keep it simple: You'll notice that we used very few ingredients to make this meal because Rosalind believes that less is definitely more. Following this meal, I would 100% agree. It showcases the ingredients better and rather than running around [and potentially failing at] making a complicated dish, it is a lot less stressful! 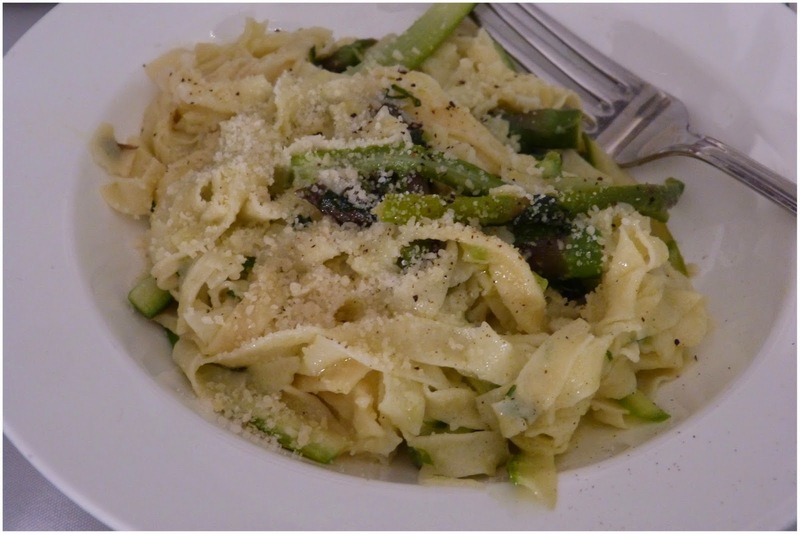 On the menu: fresh pasta with asparagus and garlic flowers and for dessert tiramisu. 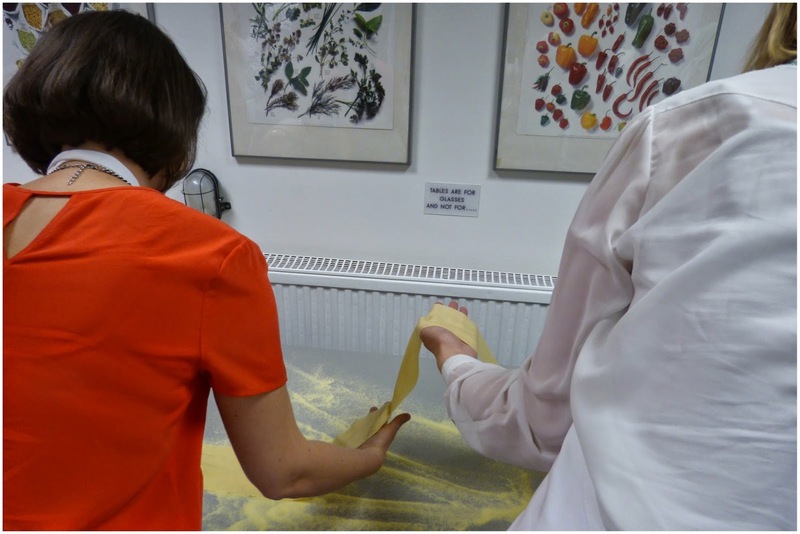 First, Rosalind and John demonstrated how to make the basics of our meal: tagliatelle and biscuits. 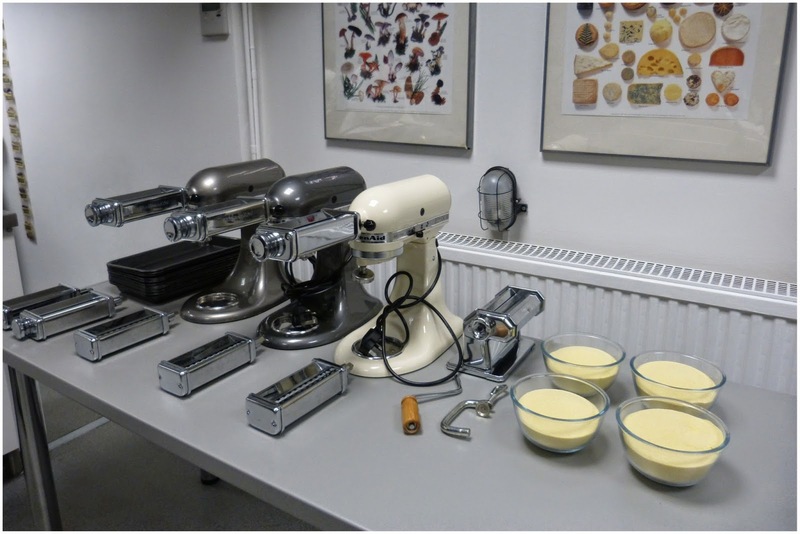 Making fresh pasta is actually really simple, it just involves plain flour, semolina flour, eggs and a pasta machine [need to invest in one of these!]. 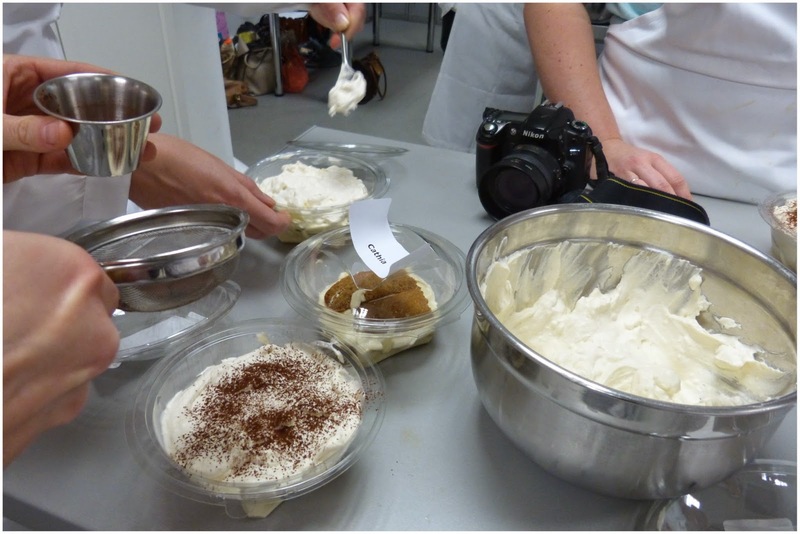 The biscuits for the tiramisu were also equally simple, this involved eggs, cake flour and sugar. That's it. There I was thinking we'd have to remember lots. It is so straight-forward that they do the same classes with kids [who get it] - no excuses then! After the demonstration, Rosalind's team then got us prepared to get our cook on. 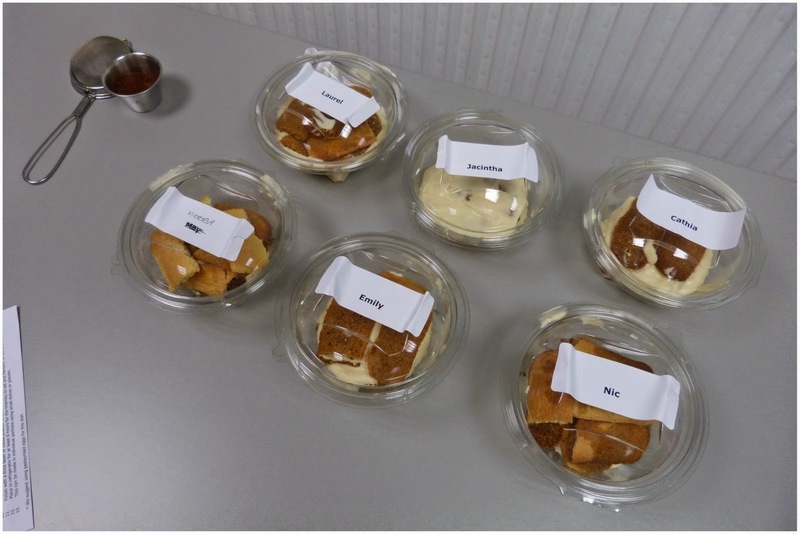 We got into teams of six and were kitted out with all of the equipment, [all measured out] ingredients and recipes needed. The dough we used had been made that morning [needed time to do its magic]. We divided our dough into quarters and started feeding into the pasta machine. 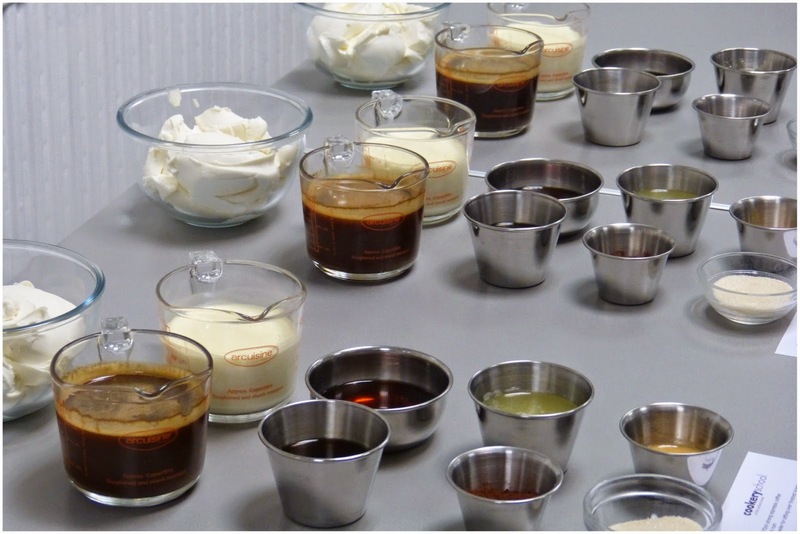 You start off with the thickest setting and as the dough gets smoother you increase the setting to make it thinner. 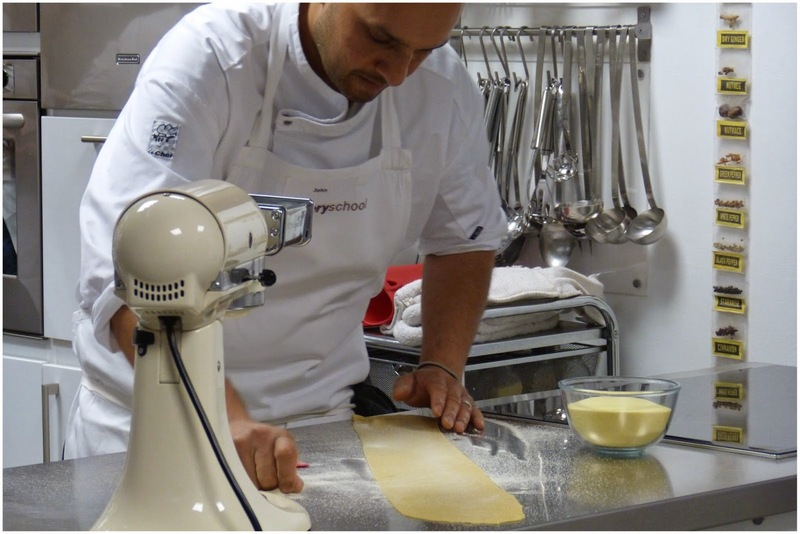 The thinner the dough, the better the pasta [Masterchef doesn't lie]. If the pasta gets sticky, you add a little semolina. As the dough extends, you may need a partner in crime to help hold it. We were taught to try and use the back of our hands as this is cooler [so less of a sticky situation]. Once it's thin enough, you then cut into manageable strips with a pizza cutter. 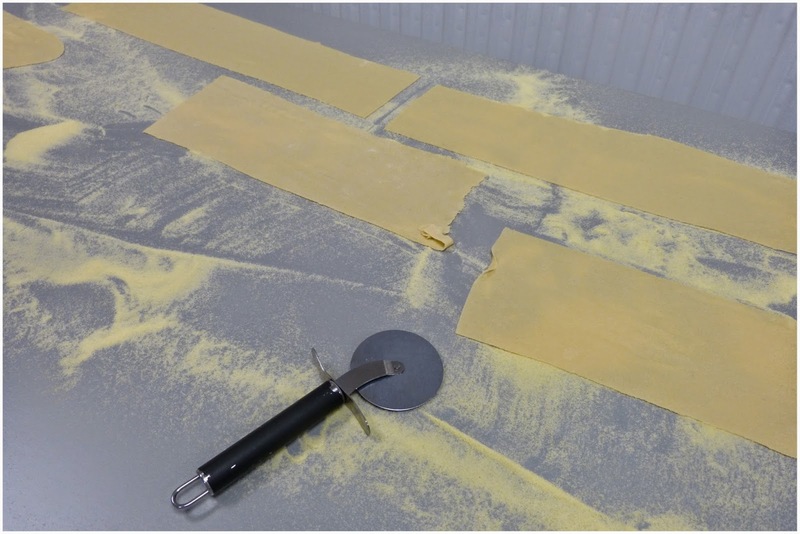 Finally, you feed these pieces one by one through the tagliatelle setting on the pasta machine. 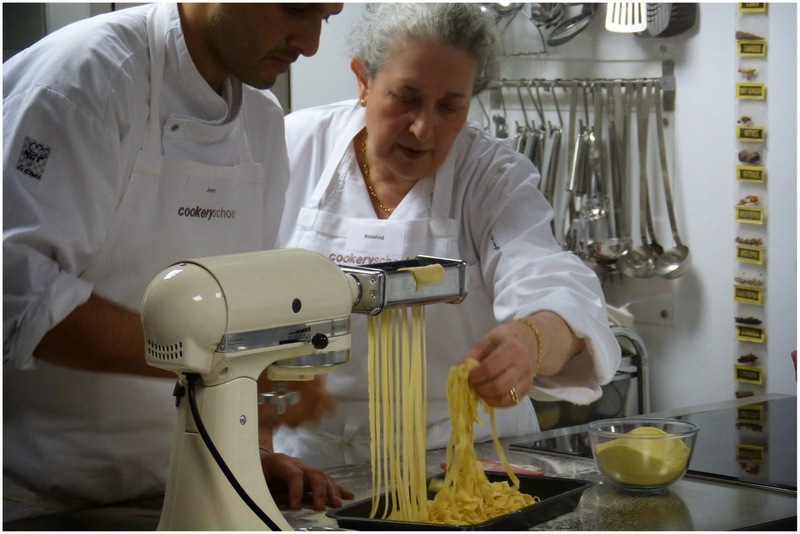 Strands are kept separate by adding a little more semolina into the mixture. 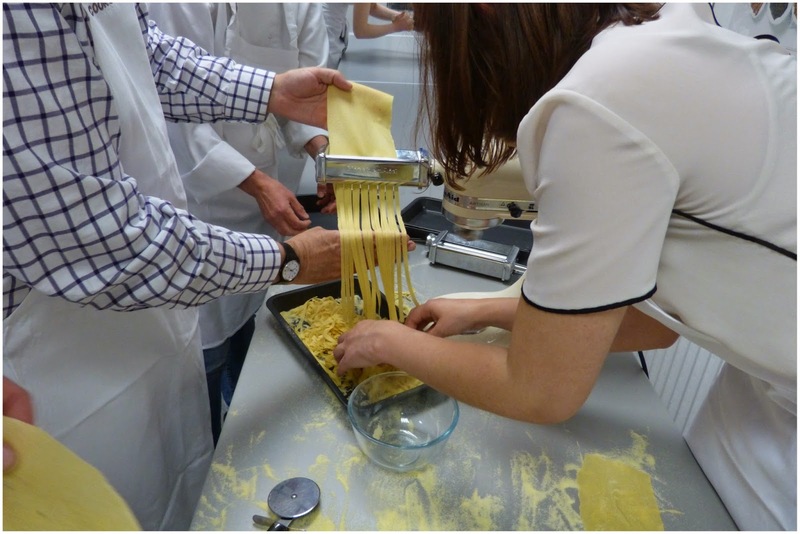 I was not great at pasta making, but some of my team were instant pros. Emily found it really therapeutic too! 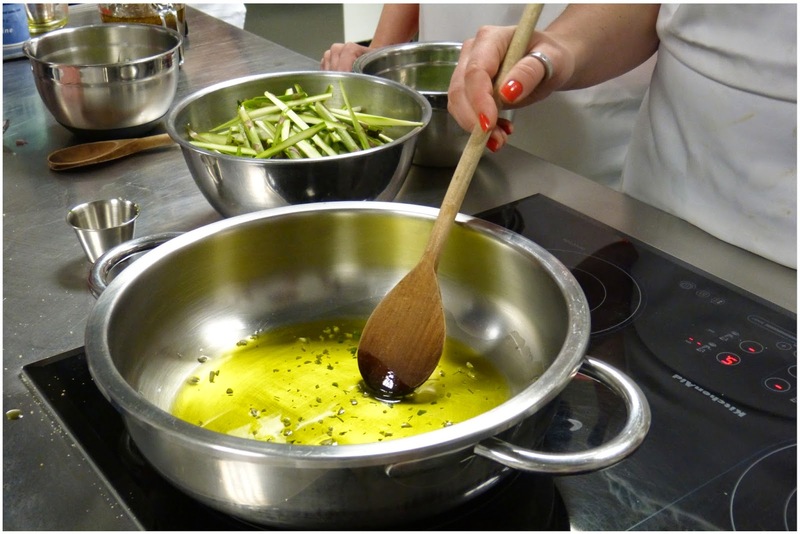 Our pasta sauce was made up of three ingredients: asparagus, garlic and olive oil. 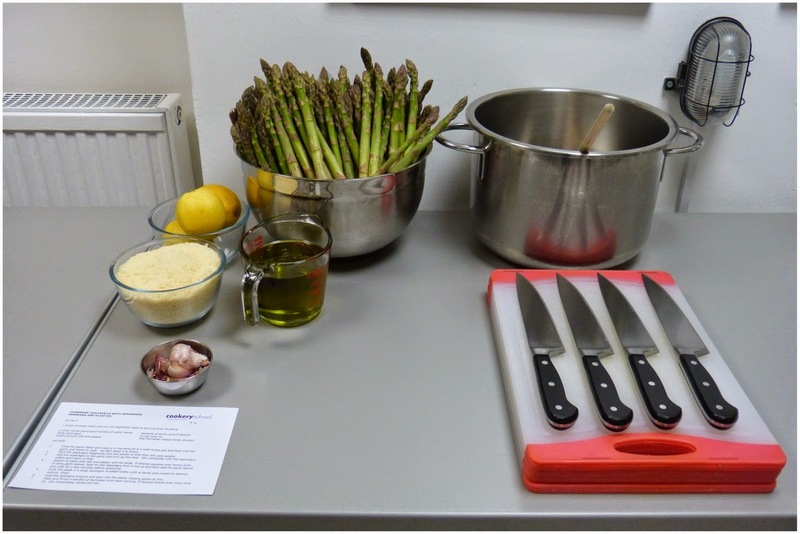 First, we cut of the asparagus heads and sliced the stalks lengthways to imitate tagliatelle slithers. 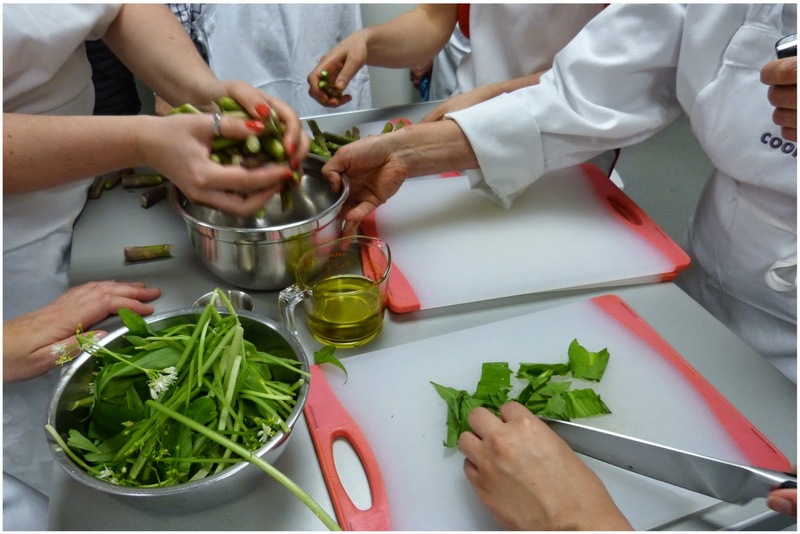 Then, the garlic leaves [which are beautiful and super fragrant] and cloves were finely chopped. We put some oil in a pan and added the diced garlic cloves [EXPERT TIP - always add garlic in when the oil is cold, it has a high sugar content so will burn very quickly and become bitter if added to hot oil]. 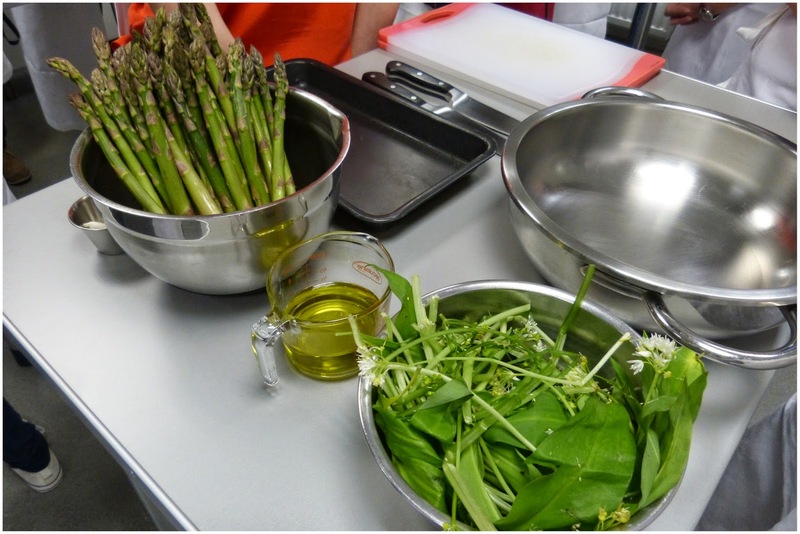 Once the oil starts bubbling a little, add the asparagus [these take a little longer to soften vs. the garlic leaves]. 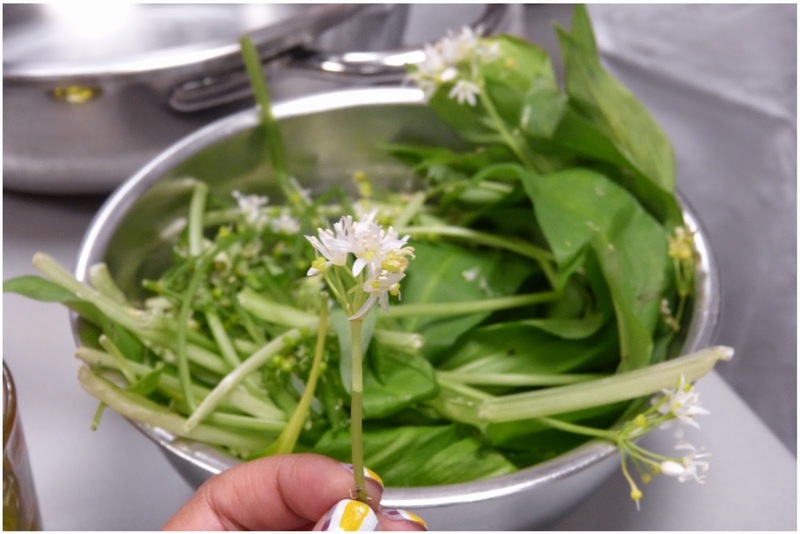 Then add your garlic leaves and flowers and after a minute or so the room will smell delicious. In this time, get your pasta on - it will only take a couple of minutes. If you hate cream, don't read on. If you love cream, this is the one. Whisk up some mascarpone cream and your egg yolks. Then, gently fold in your [separately] whisked double cream and [separately] whisked stiff egg whites and caster sugar. Once mixed together, add in the Marsala. This is your delicious cream layer. Add this into the bottom of your bowl, then get your freshly made biscuits and dip into an expresso and rum mixture. This last bit literally takes a second on each side, any more and your biscuits will crumble. Add the espresso-soaked biscuits onto the cream and get to layering - meaning, repeat please. Until it's full to the brim. Then, sprinkle some cocoa powder onto your last layer of cream. Done. EAT IMMEDIATELY. I'm joking [a little]. You'll then need to put this beauty in the fridge for at least 6 hours to set and let those flavours blend. You will notice however that unlike the majority of my team, I decided to unintentionally go cream-heavy. It was worth it. As soon as everything was made, Rosalind's team quickly cleared away all of our mess and created a long dining table. We were then served our creations restaurant-style with the addition of a side salad and after dinner coffee with chocolate nut clusters. It was such a treat and I have to say the food smelt and tasted fantastic. Maybe even more so because we'd put the work into it. It was such a fantastic experience. 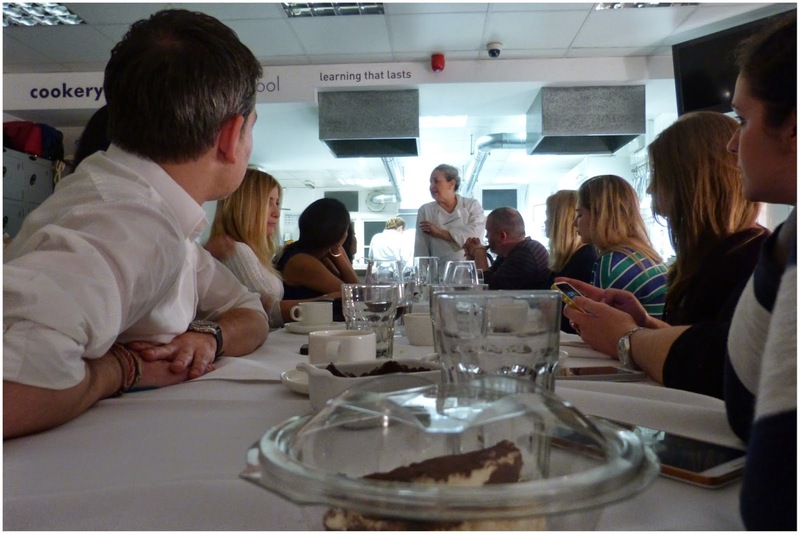 I would like to say a massive thank you to +Chris Osburn of Tikichris.com for inviting me along and to the team at Cookery School for being great teachers, particularly Rosalind who genuinely made my evening. 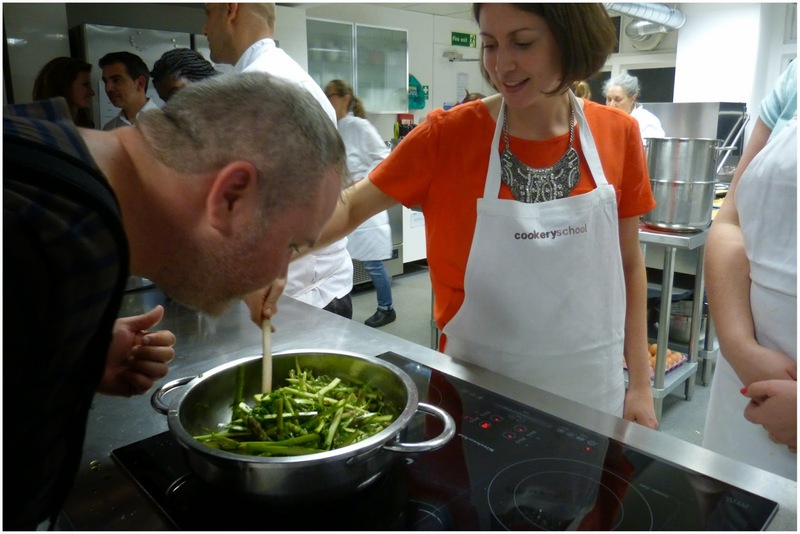 Learning how to cook in a proper kitchen can be intimidating and scary - Rosalind made me feel instantly comfortable and excited to go back for more. Last but not least, thank you to my fellow team mates - a biscuit-stealing-finger-tasting-even-though-it-was-banned bunch - for the giggles. A great experience that I would highly recommend. 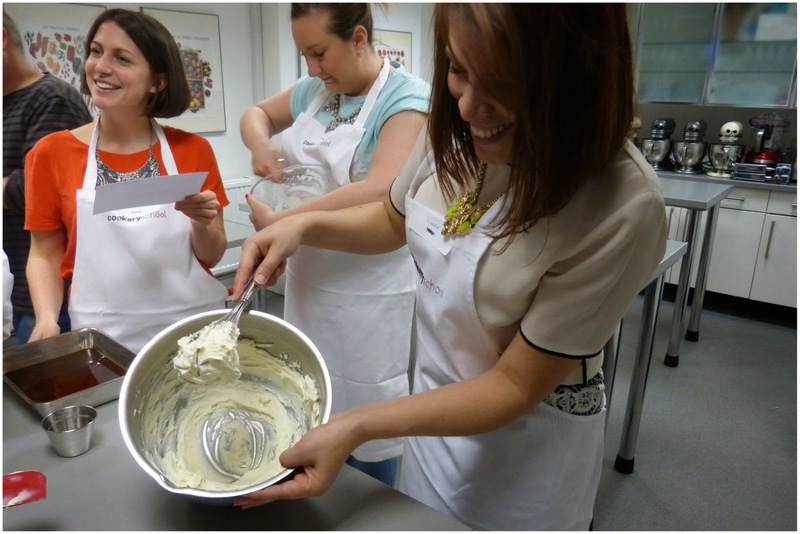 I'll be going back for the bread making course when it's back up if anyone fancies joining!